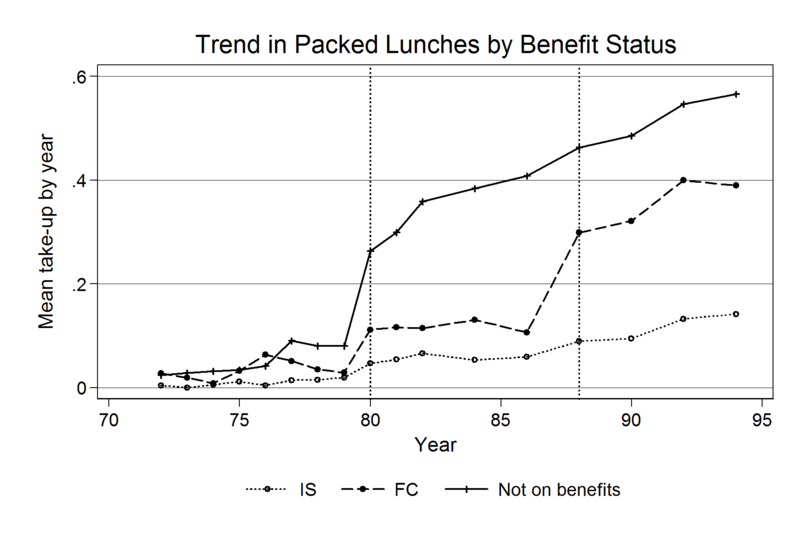 School meals and packed lunches – How important is government policy? Last week’s government-commissioned school food review showed that the nutritional quality of school food has improved substantially since 2005, when Jamie Oliver started its campaign to improve the nutritional value of school meals. Nevertheless, take-up of school meals remains low, at 43%. In other words, 57% of children are not eating school lunches, but bring a packed lunch, have snacks, or buy their food elsewhere. The report shows that the majority of these meals are unhealthy. In fact, in contrast to what most parents think, only 1% of packed lunches meet the nutritional standards, as they tend to include sweets, sugary drinks, and savoury snacks. 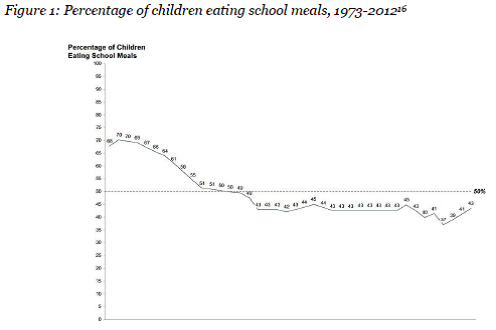 Figure 1 is taken from last week’s school food review (p.42), showing that school meal take-up dropped from around 70% in the early 1970s to just over 40% in the late 1980s. Why has this take-up declined so dramatically? The authors of the review state that the reasons for this decline are complex. They argue that it may be partly driven by the rampant inflation of the mid-seventies, but also by the removal of the national fixed pricing of school meals. The main effect of second reform, the 1988 Local Government Act, was a tightening of eligibility rules: children in families receiving Family Credit (FC) were no longer eligible for free meals, with only those on Income Support (IS) remaining eligible. I next investigate whether the reforms affected children’s Body Mass Index (weight in kilograms divided by height in metres squared). The results, however, show no consistent evidence that the reforms resulted in changes in children’s body weight. With almost one in five 11-year-old children currently obese, this is obviously good news. However, as the data are not representative of today’s society, with large changes in the nutritional environment since the 1980s, we cannot extrapolate these results to the current context, nor can we argue that today’s school meals or packed lunches do not affect children’s weight. 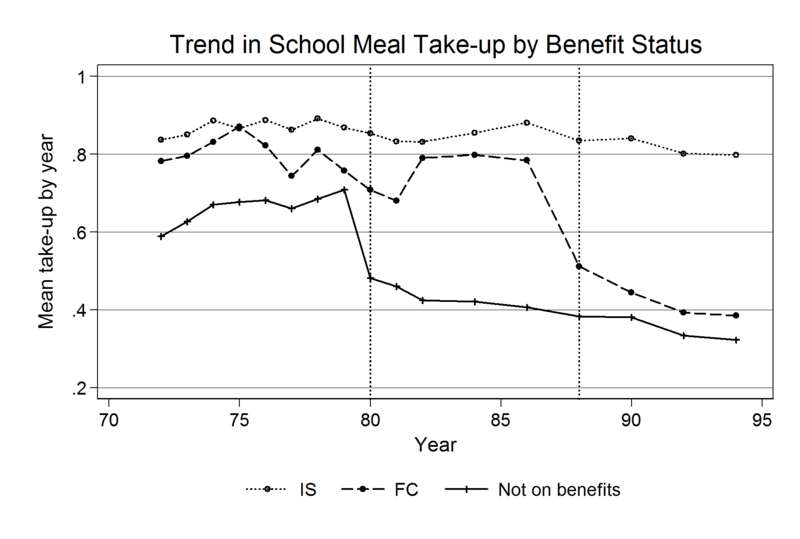 In addition, although I find no effects on child body weight, there may have been other advantages of the government-provided school meals, such as better academic attainment, or better health and nutritional outcomes later in life. Unfortunately, I have no data to explore this further.